Maxillofacial fractures result from blunt or penetrating trauma. [1, 2, 3, 4, 5, 6, 7] Blunt injuries are far more common, including vehicular accidents, altercations, sports-related trauma, occupational injuries, and falls. Penetrating injuries include gunshot wounds, stabbings, and explosions. Simple nasal fractures are the most common of all facial fractures. Zygomatic arch fractures generally occur in 2 or 3 locations along the arch. Zygomaticomaxillary, ot tripod, fractures occur at articulations of the zygoma with the frontal bone maxillae and zygomatic arch. Alveolar fractures occur just above the level of the teeth through the alveolar portion of the maxilla. Le Fort or midface fractures are classified as types I, II, and III. Type I fracture extends through the lower third of the septum and involves the maxillary sinus. Type II (pyramidal) fracture extends from the nasal bone, through the lacrimal bone, and down through the zygomaticomaxillary suture.Type III fracture separates facial bones from the cranium, causing the face to appear long and flat. Endotracheal anesthesia and radiography developed during the First World War led to better understanding and treatment of facial fractures. During the Second World War, a multidisciplinary approach to treatment of facial fractures continued to improve the outcomes of severely injured soldiers. The more recent introduction of CT reconstruction, along with new surgical techniques, has improved cosmetic results immensely. Mass, density, and shape of the striking object, as well as speed of impact, directly affect type and severity of facial injury. The force required to fracture various facial bones may be classified as high impact (greater than 50 times force of gravity [g]) or low impact (less than 50 g). Simple nasal fractures are the most common facial fractures and must be distinguished from the more serious nasoethmoidal (NOE) fractures. 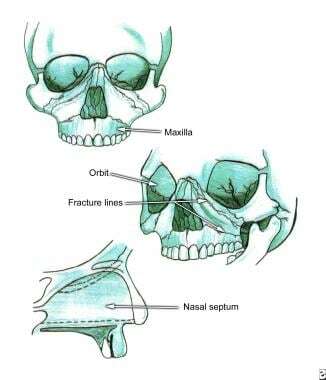 NOE fractures extend into the nose through the ethmoid bones. Fractures through the ethmoid are prone to cerebrospinal fluid (CSF) leaks from dural tears. Zygomatic arch fractures tend to occur in 2-3 places along the arch. Often, 3 breaks occur, 1 at each end of the arch and a third in the middle, forming a V-shaped fracture; this often impinges on the temporalis muscle below, causing trismus. Zygomaticomaxillary (tripod) fractures result from a direct blow to the cheek. Fracture occurs at articulations of the zygoma with the frontal bone maxillae and zygomatic arch and often extends through the orbital floor. Because the infraorbital nerve passes through the orbital floor, hypesthesia often occurs in its sensory distribution. Alveolar fractures occur just above the level of the teeth through the alveolar portion of the maxilla. Usually a group of teeth is loose, and blood is noted at the gingival line. Le Fort or midface fractures are classified into 3 types and occasionally are mixed from one side of the face to the other. Le Fort I: Horizontal maxillary fracture separates the maxillary process (hard palate) from the rest of the maxilla. Fracture extends through the lower third of the septum and involves the maxillary sinus. This is below the level of the infraorbital nerve and thus does not cause hypesthesia. Le Fort II: Pyramidal fracture starts at the nasal bone, extends through the lacrimal bone, and courses downward through the zygomaticomaxillary suture. It courses posteriorly through the maxilla and below the zygoma into the upper pterygoid plates. The inner canthus of the nasal bridge is widened. Because the fracture extends through the zygoma, near the exit of the infraorbital nerve, hypesthesia often is present. Bilateral subcutaneous hematomas often are present. Le Fort III: Craniofacial dysjunction also starts at the nasal bridge. It extends posteriorly through the ethmoid bones and laterally through the orbits below the optic foramen, through the pterygomaxillary suture into the sphenopalatine fossa. This fracture separates facial bones from cranium, causing the face to appear long and flat (ie, dish face). For more information, see Medscape's Trauma Resource Center. Approximately 3 million facial injuries occur annually, but most do not involve maxillofacial fractures. [8, 4, 5, 6, 7, 9, 1] One study placed the incidence of severe maxillofacial injury (fractures and lacerations) at 0.04-0.09% for motor vehicle collisions. Motor vehicle-related injuries are more common in rural areas, and altercation-related injuries are more frequent in inner cities. Incidence of other major injuries is as high as 50% in high-impact facial fractures, compared with 21% for low-impact fractures. Motor vehicle collision-related fractures are more likely to have associated injuries than violence-related fractures. The mortality rate is as high as 12% in high-impact fractures but is rarely due to maxillofacial injury. The incidence of associated cervical spine injuries has been reported in the 0.2-6% range. Adult male-to-female ratio is 3:1. Suspect domestic violence or sexual assault in women as this may coexist in 30% of cases. If band arch wires are placed, teach patients how to release the crossband in an emergency. Give instructions for epistaxis if this has occurred. For patient education resources, see the Back, Ribs, Neck, and Head Center and Breaks, Fractures, and Dislocations Center, as well as Black Eye. McCay MP. Facial trauma. Marx JA, Hockberger RS, Walls RM, et al, eds. Rosen's Emergency Medicine, Concepts and Clinical Practice. 6th ed. Philadelphia, PA: Mosby; 2006. Vol 1: 39, 382-398. Motamedi MH, Dadgar E, Ebrahimi A, Shirani G, Haghighat A, Jamalpour MR. Pattern of maxillofacial fractures: a 5-year analysis of 8,818 patients. J Trauma Acute Care Surg. 2014 Oct. 77 (4):630-4. [Medline]. Allareddy V, Itty A, Maiorini E, Lee MK, Rampa S, Allareddy V, et al. Emergency department visits with facial fractures among children and adolescents: an analysis of profile and predictors of causes of injuries. J Oral Maxillofac Surg. 2014 Sep. 72 (9):1756-65. [Medline]. Hendler BH. Maxillofacial trauma. Rosen P, ed. Emergency Medicine Concepts and Clinical Practice. Mosby-Year Book; 1998. 1093-1103. Smith RG. Maxillofacial injuries. Harwood-Nuss A, ed. The Clinical Practice of Emergency Medicine. Lippincott, Williams and Wilkins; 1991. 337-343. Thomas, SH, Sheperd, SM. Maxillofacial injuries. Harwood- Nuss, ed. The Clinical Practice of Emergency Medicine. Lippincott, Williams & Wilkins; 1996. 408-18. Hasan N, Colucciello SA. Maxillofacial trauma. Tintinalli JE, Gabor KD, Stapczynski SJ, eds. Emergency Medicine: A Comprehensive Study Guide. 6th ed. McGraw-Hill Co Inc; 2004. chap 257, p1583-159. McGill J, Ling LJ, Taylor S. Facial trauma. Rosen P, ed. Diagnostic Radiology in Emergency Medicine. Mosby-Year Book; 1992. 51-76. Sullivan WG. Trauma to the face. Wilson RF, Walt AJ, eds. Management of Trauma: Pitfalls and Practice. 2nd ed. Lippincott, Williams & Wilkins; 1996. 242-269. Salentijn EG, Peerdeman SM, Boffano P, van den Bergh B, Forouzanfar T. A ten-year analysis of the traumatic maxillofacial and brain injury patient in Amsterdam: incidence and aetiology. J Craniomaxillofac Surg. 2014 Sep. 42(6):705-10. [Medline]. Salentijn EG, Collin JD, Boffano P, Forouzanfar T. A ten year analysis of the traumatic maxillofacial and brain injury patient in Amsterdam: Complications and treatment. J Craniomaxillofac Surg. 2014 Jun 12. [Medline]. Yamamoto K, Matsusue Y, Murakami K, Horita S, Sugiura T, Kirita T. Maxillofacial fractures in older patients. J Oral Maxillofac Surg. 2011 Aug. 69(8):2204-10. [Medline]. Glynn SM, Asarnow JR, Asarnow R, et al. The development of acute post-traumatic stress disorder after orofacial injury: a prospective study in a large urban hospital. J Oral Maxillofac Surg. 2003 Jul. 61(7):785-92. [Medline]. Spoor TC, Ramocki JM, Kwito GM. Ocular trauma. Wilson RF, Walt AJ, eds. Management of Trauma: Pitfalls and Practice. Lippincott, Williams & Wilkins; 1996. 225-241. Snell RS, Smith MS. The face, scalp, and mouth. Clinical Anatomy for Emergency Medicine. Mosby-Year Book; 1993. 206-241. Magarakis M, Mundinger GS, Kelamis JA, Dorafshar AH, Bojovic B, Rodriguez ED. Ocular Injury, Visual Impairment, and Blindness Associated with Facial Fractures: A Systematic Literature Review. Plast Reconstr Surg. 2011 Sep 14. [Medline]. Gervasio KA, Weinstock BM, Wu AY. Prognostic Value of Ocular Trauma Scores in Patients With Combined Open Globe Injuries and Facial Fractures. Am J Ophthalmol. 2015 Nov. 160 (5):882-888.e2. [Medline]. Hwang K, Kim DH. Analysis of zygomatic fractures. J Craniofac Surg. 2011 Jul. 22(4):1416-21. [Medline]. Friedman A, Burns J, Scheinfeld MH. Significance of post-traumatic maxillary sinus fluid, or lack of fluid, in a level II trauma population. Emerg Radiol. 2015 Dec. 22 (6):661-6. [Medline]. Mehta N, Butala P, Bernstein MP. The imaging of maxillofacial trauma and its pertinence to surgical intervention. Radiol Clin North Am. 2012 Jan. 50 (1):43-57. [Medline]. Javadrashid R, Khatoonabad M, Shams N, Esmaeili F, Jabbari Khamnei H. Comparison of ultrasonography with computed tomography in the diagnosis of nasal bone fractures. Dentomaxillofac Radiol. 2011 Dec. 40(8):486-91. [Medline]. Sitzman TJ, Hanson SE, Alsheik NH, Gentry LR, Doyle JF, Gutowski KA. Clinical criteria for obtaining maxillofacial computed tomographic scans in trauma patients. Plast Reconstr Surg. 2011 Mar. 127 (3):1270-8. [Medline]. Avery LL, Susarla SM, Novelline RA. Multidetector and three-dimensional CT evaluation of the patient with maxillofacial injury. Radiol Clin North Am. 2011 Jan. 49 (1):183-203. [Medline]. Mundinger GS, Borsuk DE, Okhah Z, Christy MR, Bojovic B, Dorafshar AH, et al. Antibiotics and facial fractures: evidence-based recommendations compared with experience-based practice. Craniomaxillofac Trauma Reconstr. 2015 Mar. 8 (1):64-78. [Medline]. The bony walls of the orbit.